Evaluation program for professors, teachers and trainers - send us an email of what materials you would like to evaluate with an institutional email address (.edu, K-12, corporate) and best phone number to reach you. We will get back in touch with you to arrange delivery. Call us at 727-657-0089 to discuss which games might be useful for your next class or training. Our Negotiation Training Games are Must-Haves for Group Problem Solving Training and Practice. New Pricing on Negotiation Preparation Software - Latest Version 5.0 International for Windows $249.00! When you download a game, all games now include the Player's Plan, Strategic Tips, Team Leader's Plan and Complete Leader's Guild. If you do not find these free materials please email us at info@negotiatorpro.com. Are you aware that negotiation is a group problem solving exercise? Our games and software zero in on the challenge of group problem solving. While our tools support the principled negotiation approach of Fisher, Ury, and Patten, as described in Getting To Yes: Reaching Agreement Without Giving In, we have also developed an efficient negotiation, mediation, and Negotiation Problem Solving Process. This problem solving process supplements the principled negotiation approach. This process method for negotiating gives users new sources of Tutorial On Your Power in Negotiations and does not require you to be nice (or mean). It allows participants to pursue their interests, maximize value for everyone, and leave as little as possible on the table. We also develop Custom Negotiation Games/Simulations of our software and role plays for your particular personal or organizational needs for negotiation training or for fundraising. See our group negotiation and problem-solving system. This is a system that can be extremely useful to you or your organization or your students, then the price you will pay for these materials is extremely modest compared to the benefits gained -- not to mention the peace-of-mind that comes from efficiently crafting ethical and creative mutual gains negotiation agreements! Explore the world of negotiation interests vs. positions, the dual concern model, principled negotiation, and mutual gains bargaining. Have fun and learn while playing our role play games. Negotiation is much more than bargaining. For starters, it involves group problem solving, leadership, assertiveness, active listening, agenda formation, alliance building, long range and short range bargaining strategies, and more. See our Interesting Negotiation Links collection which connect you to a wide variety of negotiation materials on the world wide web. We have spent nine years developing negotiation preparation software, and the last seven years developing a series of related paper-based role play simulations. These 'games' are powerful and useful for both the quiet analytical person and the aggressive verbal person. They both can learn new ideas and also new behaviors. 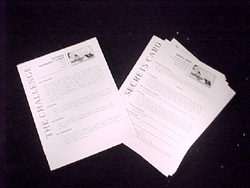 The games have been used at numerous graduate programs, including Tufts Un. graduate Department of Urban and Environmental Planning, Boston Un. School of Law, Northeastern Un. School of Law, and numerous corporations have used the simulations and/or the preparation software including the Environmental Protection Agency, Ford Motor Co., Genentech, Motorola, and numerous others. Our software has been positively reviewed in The New York Times, Fortune, Forbes, Inc., PC Magazine, PC World, Training, Info World, The Robb Report, The National Law Journal and The ABA Journal, Investors Business Daily, Toronto Globe and Mail, International Herald Tribune, Financial Times of London, and elsewhere.